"The Future of Medical Missions"
We will always be grateful to Samaritan's Purse for these past several years. They are an organization of faith and integrity that has made it possible for us to do what we do these past two years, both financially and in other ways as well. And we hope that in years to come we can continue to partner with this organization in many different ways. One of the ways they have supported us is through publicity. This month is no exception: the McCropders were featured in the quarterly World Medical Missions newsletter, On Call. Read the full story here, or click the link below. The Fader family will remember 2011 for many wonderful things in Kenya, but 2011 will also go down as the Fader Family Year of Dental Disasters. Just kidding. These are not our teeth. But this is a common look for Kenyan teeth in our area, due to excessive fluoride levels in the ground water in our area, and also due to lack of sufficient dental care. If you'd like to read more about dentistry in Kenya, you can find some great stories here. Our dental drama began six months ago when our 5-year-old began to grow her first permanent teeth... in a nice straight line of their own... behind her study little baby teeth. Take a look, and share our horror in anticipating ghastly orthodontic bills in her future. (Our fears abated when we realized that there are no cosmetic orthodontists in Burundi... maybe we can just teach her to keep her teeth covered with her lips.) We emailed our friend and dentist, Hank, back in the USA. He broke the news that those front little teeth would probably have to be pulled. And that those new teeth should move forward into line with time. Let's hope. Meanwhile, upon taking a careful look in our 2-year-old's mouth, I discovered funny-looking small bilateral discolored dots on her first top molars. Strange. Tenwek's dentist, our friend Peter Kuyaya, referred us to a pediatric dentist who was coming for a visit a few weeks later. She diagnosed that those little teeth had not formed properly during Abi's infancy, probably due to her illness in the orphanage before she came home. She said Abi would need crowns on those molars. Who has ever heard of a 2-year-old with crowns?! The girls were troupers as Anna had 5 teeth extracted, and Abi had her tooth bling inserted. Anna was thrilled with the results. We were also pretty pleased with the total combined bill: $210. A few weeks later, Abi knocked her upper lip into the corner of something, and soon thereafter, one of her upper middle teeth turned a shade of gray. Emailed pictures to Hank again. Nothing we can do about this one. Just as I was thinking our dental drama was over, I felt a dull pain in my lower jaw. Then I felt a hard bony something poking through the gums back there. Wisdom teeth. Sigh. More emails to our friend Hank. And another visit to our friend Peter. An x-ray showed that these teeth are coming in at an angle that requires extraction by an oral surgeon. He gave me chlorhexidine rinse to keep infection away until I could have them removed in the US. Adding insult to injury, chlorhexidine turns teeth yellow. After I had been rinsing daily for few months, Anna told me, "Mommy, if I were going to draw you with your teeth, I would use a yellow crayon!" Sigh. I'm not complaining, however. This is definitely preferable to the fluorosis pictured above. Anyway, tomorrow is the day for the extraction of my four troublesome wisdom teeth. You could take a moment to pray for no complications. You could also pray for a dentist to come and work with us in Burundi someday - we could definitely keep one or two dentists busy. What About The Blog While Stateside? Some of you may be wondering: Now that all the McCropders have relocated to the US for the year, what will henceforth be the pattern of this blog? This year is certainly not a "year off", and missions communities have come to call this time "home ministry assignment" or "HMA". Yet, without daily interaction with African culture and medicine, many blogs hibernate in a pretty severe way while stateside. 2. Readjustment to the US: I thought our most common question upon returning would be "How was Kenya? ", which is natural and, of course, unanswerable. I've been surprised that the most common question is "What is it like readjusting to US culture?" Given the interest, we will share some on this, and we'll try not to go overboard, since this blog is more about connecting to Africa than connecting to US culture. 3. The Onward Journey: Our community of families is entering another phase, complete with new challenges and joys. Our philosophy has been to openly and honestly share this journey with any that are interested (as well as try to generate interest in those that aren't! ), and we will strive to be consistent with that, so that you can know us better, pray for us, and learn along with us from all we go through. All this to say: Continue to check in on the site here, as we will continue to share. Thank you for your interest and encouragement. It is extremely helpful to us. Well, in some ways, this is a pretty big milestone. As many of you know, for the last two years, our work in Kenya has been wonderfully supported by Samaritan's Purse. We are grateful for their support, as well as the support that many individuals and churches have given to supplement this in many important ways. We believe that the fruit of this is some very good work being done for the needy and for the kingdom of our Lord Jesus. This situation has now changed dramatically. As was recently posted, our time with Samaritan's Purse has finished, and we are officially World Harvest missionaries now, and what that means is that we have officially entered the period of time where we are raising support for our future work in Burundi. We are crazy excited about this work. This will take a lot of financial support, and we are also excited about the chance to bring other people into this vision in this manner. You will surely be hearing more about this in the days to come, but for the time being, we have updated our donation info page (click here or on the right-hand sidebar picture), where you will find some very easy web-based giving options. Primarily though, if you are interested in giving and partnering with us, please contact one (or all!) of us by clicking here, and we would be grateful for the chance to tell you more about what we are so excited about and ways that you can be a part of making it happen. Well, we got the word back yesterday and you're now "looking" at World Harvest Mission's newest missionaries! We feel fully evaluated (having written an extensive application, taken psych testing/profiling, and sitting through both group evaluations and personal interviews) and are glad that WHM has agreed to take us on for this wild ride of McCropders to Burundi. Thought you might enjoy hearing a little bit about our new family...I don't think we ever blogged about choosing an agency, which might be of interest to some. World Harvest first came to our attention several years ago. Our missions pastor, Bob Lynn, used to sit on the Board, and one of our other mentors, Steve Telian, had connections as well. 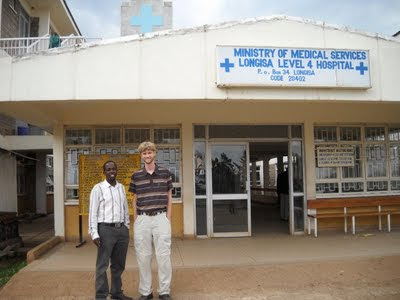 When the guys went to Brackenhurst (a continuing medical education conference held in Kenya every 2 yrs for missionaries) in 2010, they met up with a few WHM missionaries but quickly dismissed WHM as a potential agency because at that time WHM was only working medically at a small clinic in rural Uganda, not really the place for us. Fast forward 18 months. We felt that Burundi was where God was calling us next, but basically no one was working there in terms of agencies. We approached a few and none were interested in opening new fields for medical missions. So we returned to World Harvest. They were not only interested, but excited about the possibilities, and officially accepted Burundi as a new field last March. So, who is World Harvest? They were started out of New Life Presbyterian Church (founded by Jack Miller) just over 25 years ago, and now have over 150 missionaries working mainly in Europe and East Africa. Overall, it's a pretty small non-denominational mission and has a wonderful family feel to it. The McLaughlins and Alyssa were able to attend the East Africa field retreat last August in Mombasa, Kenya, and we were impressed by the quality of people in the mission--real people, admitting their faults, holding to grace, loving God. The mission of WHM is this: Laying down our lives to proclaim the Kingdom of Jesus Christ through preaching, healing, and equipping. It might not seem all that unique to some of you, but for us, it captures exactly what we want to do and we are excited to be a part of it. World Harvest does have a history of sending groups such as ours onto the missions field. They primarily do church planting and discipling, whereas our focus will be more medical training (and discipling as well). There are still many details and logistics to work out, so please pray for WHM and for us as we grow together. But for now, let us say that we are excited at this next step God has brought us along, we are blessed to be a part of this new community, and we look forward to many years to come. As of last week, all of the McCropders have landed back in the USA. In fact, this week, the McCropder adults have all convened in Philadelphia. We are happily together here for a week of Assessment & Orientation with World Harvest Mission. As we meet the staff and learn more about the organization, we are continually impressed! It is great to explore with World Harvest the future possibilities in Burundi. And we really enjoy learning from the staff-members as they talk with us about their experiences in missions. It should also be noted that World Harvest's hospitality has been fantastic, and the Philly Cheese Steak Pizza was a big hit today at lunch. Tomorrow each person has four hour-long interviews, and then on Wednesday we hope to receive formal acceptance as World Harvest missionaries. We appreciate your prayers this week as some important discussions and decisions are made. 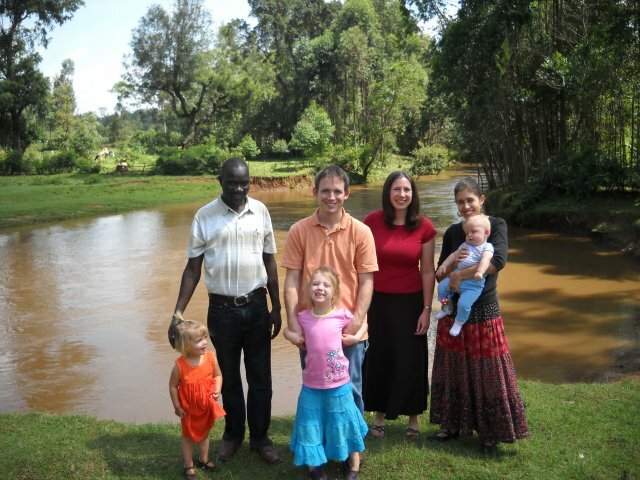 We have had many chances over the past two years to visit out Kenyan friends in their homes. Some live in apartments not that different than our own. 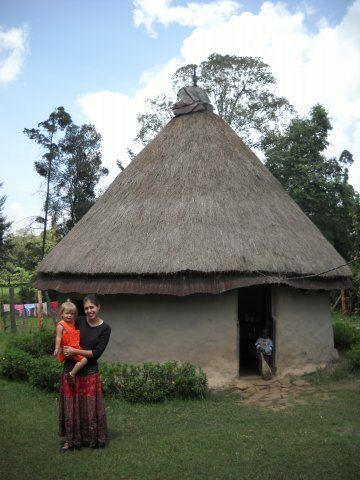 Some live in cinderblock homes, and some live in traditional Kipsigis mud and thatched roof homes. 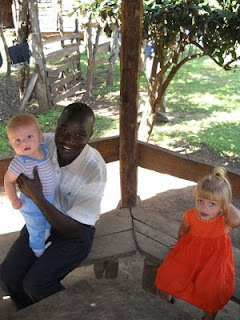 One of our interns, Kibet, invited us to his home for chai to say goodbye. We had previously visited his church and eaten at an uncle's home, but Eric had been on call that weekend, so we were invited for another visit so Eric could come along. I'll tell you this: Kenyans do many things well. One is hospitality, and another is goodbyes. We got to experience both at Kibet's. We (Alyssa, McLaughlins, Jason/Anna, and Heather's dad) first gathered together under a little gazebo to visit and eat green loquats (perhaps more on this interesting fruit in future posts). Then Kibet gave us a tour of his family's land, including a foot bridge crossing the idyllic Chepkulo River, livestock, and a variety of crops and buildings. After the tour, we returned to Kibet's home for chai. 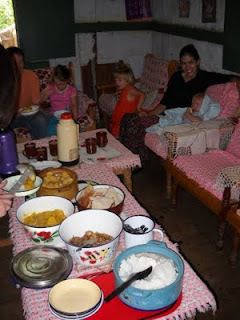 We had specifically said that we would be unable to stay for lunch, so despite the fact that it was 11am, Kibet's family laid out quite a spread for chai: pumpkin, chicken, potatos, rice, and bread. After eating and introductions came the gift exchange. 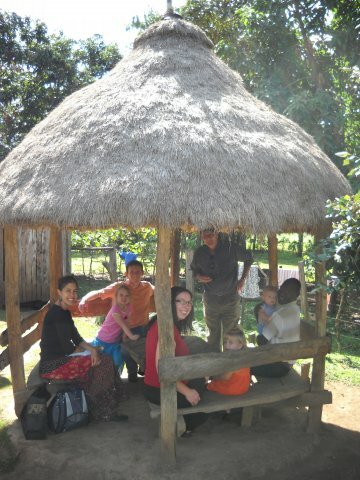 Kibet and his family gave each of our families the gift of a calabash. It's a special gourd, dried and hollowed out and scraped with charcoal that is used for "brewing" the charcoal-yogurt flavored murzik drink favored by the Kipsigis. It is a special gift of friendship, and we are honored to have it. They also gifted us with bananas and a pumpkin. In return, we thanked them by giving them a few US treats. 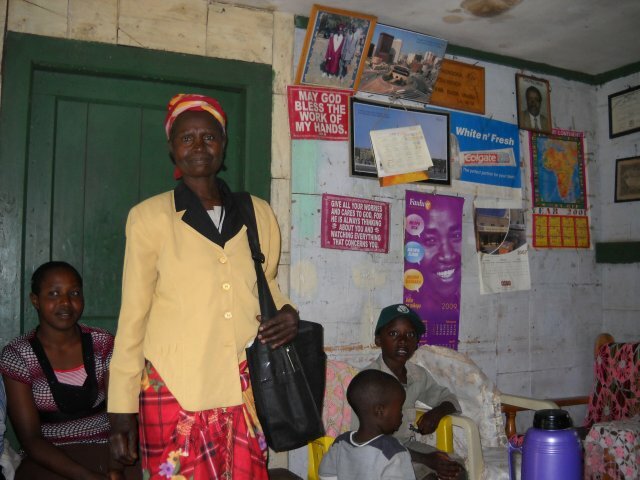 Kibet's grandma liked the bag they came in the best, I think! It was 2008. The McCropders had gathered together at the Global Health Missions Conference in Louisville to find a hospital. We had all already been accepted into the Post Residency Program, and they were willing to send us as a group, but the biggest logistical challenge was going to be finding a location that would accommodate 4 doctors and 3 families. 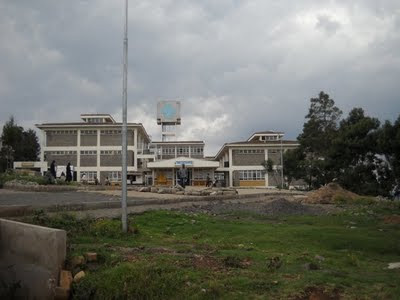 By process of elimination, the only option open to us was Tenwek Hospital. When people asked where we had chosen to go, honestly, I was embarrassed. Tenwek was the first missions hospital I had ever heard of, and it is arguably one of the most "famous" hospitals, largely due to the CMDA staff and several books that have been written. It gets 300-400 visitors PER YEAR. We had been told by people in the past that there was actually a waiting list to serve at Tenwek. Seriously? There are thousands of people dying every day in the world because they don't have access to medical care and there's a WAITING list at one hospital? Why can't people go somewhere else? I felt that in my heart in the beginning. There's so much need everywhere else, and seemingly not at Tenwek. What purpose could God have for our time there? Fast forward two years. The McCropders have just completed a two year term of service at Tenwek, and I can tell you now it was EXACTLY the place we needed to be. Here's why. 1. Education. 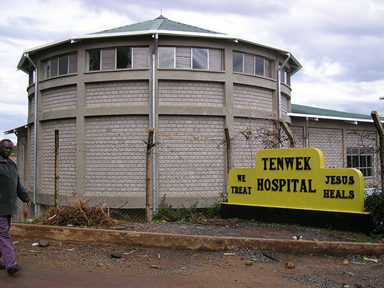 Tenwek is a unique place among missions hospitals because of the scope of education going on there. We all had some interest in education of nationals before we arrived in Tenwek, but God definitely honed and refined our calling during those two years. Not only do we think education of nationals is a good idea, but it's now our primary objective. And at any given time, Tenwek is educating 16 interns, 6+ surgery residents, and 2+ family practice residents, not to mention Kenyan and US medical students and nursing students, among others. We got a chance to see three different models of education, all at the same place. This experience will be invaluable to us as we head to a Burundian medical school next. 2. Alyssa. None of us would have guessed it at the beginning, but a big part of why Tenwek was so great for us is our newest team member. We started as 4 doctors and 6 adults, and now we are 6 doctors and 8 adults...Alyssa has been a wonderful friend, an incredible support, and a competent doctor (who helps round out the primary care aspect of our team, as she is med-peds). Had we gone elsewhere, we never would have gotten to know our new teammate! 3. Proximity to Burundi. Being on the African continent was certainly helpful as we sought to find our new location. We were all able to take trips to visit Burundi, only a short 1 1/2 hour flight from Nairobi. In the beginning, we all assumed that we could choose a place based on the recommendations of just the 2 people who had visited, but in the end, all McCropders were able to visit Burundi. This really helped us all feel more comfortable with our decision, which was a blessing. 4. Connections. One of the perks of having 300 visitors per year is that you get to meet a lot of people. We've met surgeons, pediatricians, ENTs, anesthesiologists, cardiologists, internists, urologists, cardiac surgeons, etc. Many of these people would not be able to serve overseas in less equipped hospitals. We are grateful for their help. And we've kept in contact with many, and hope that these people will be willing to come and help us out in Burundi in the future! 5. Transitions. Tenwek has been called "Africa Lite" in the past. Yes, we had hot water, appliances, internet, and fairly regular electricity. We could get many amenities in Nairobi, just three hours away. It was not hot, there were no giant bugs, there was a community of other missionaries. But it was still the Developing World which had its challenges. And we had some wonderful mentors at Tenwek that helped us figure things out: everything from homeschooling and employing househelpers to managing patients with various complications in the hospital. We could have gone to Burundi right away, but I have a feeling it would have been much harder than it will be after two years at Tenwek. So yes, Tenwek was big and famous and now even has a CT scanner. But God still knew what He was doing when He sent us there. Tenwek has lots of visitors but needs a lot of extra help to run the hospital. We will never forget these past two years in Kenya, no matter where we end up, and are so glad to have had our time there. There's a part in Wright's "Surprised by Hope" (July's Book of the Month) where he urges people, in response to a general paucity of theologically apt resurrection worship songs, to write new resurrection songs. I read this and thought, "True. But I don't really write worship songs." Alyssa read that and said, "Eric, you should do this." So I gave it a shot. Here's the result. We did end up doing this song at our church at Tenwek several times before we left. We'll see if it gets carried on. Despite living in community for the past two years, we as the McCropders have left in waves. The Cropseys left last month as you know, and are doing well back in the States. The rest of us leave this week. Forgive us as we might not post as frequently in the next few days...goodbyes, time changes, jet lag, small children...there might be a lot going on. Never fear, we will keep track of our backlog! The McLaughlins and Alyssa leave Nairobi tonight and arrive in Nashville Friday afternoon. The Faders leave Tenwek and Nairobi on Saturday and arrive in Chicago Sunday. Please pray for us during this time apart and these days of travel. For safe flights, rest for our children, timely connections, and no missing baggage. We have said many goodbyes in the past days. It has been difficult but a blessing to reflect back on all the Lord has done and all He has brought us through. Also pray for the wonderful reunions coming to us in the days ahead. Thanks for sharing these two years in Kenya with us, and we look forward to sharing many more stories with you in the days and years to come! We have also posted (albeit a bit more briefly) our Top Ten things we are looking forward to about going back to the USA. For the Americans reading this, a little chance to see your home from a bit of an outside perspective. Click here for the posts. 1. 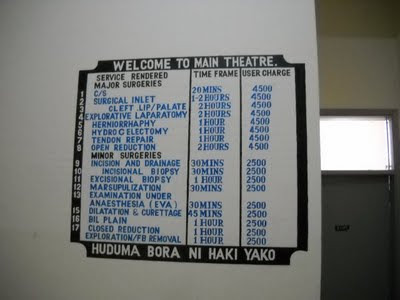 Feeling Culturally "At Home"
The medical system is Kenya is based on a hierarchical system of health centers. There are clinics and dispensaries that provide basic care to more remote settings. Then there are referral hospitals: district hospitals (level 4), provincial hospitals (level 5), and national teaching hospitals (level 6). Tenwek is a private hospital and doesn't fall into any of the above categories, although it's sort of a level 5/6. We get lots of patients referred to us from lower level hospitals, and sometimes will refer to the national hospitals in Nairobi and Eldoret for specialist care, dialysis, etc. After almost 2 yrs here in Kenya, we had never really been inside a government hospital, just some dispensaries and other missions hospitals. A former intern was working at Longisa DH just down the road and invited us over for a tour, so we jumped at the chance. We get many patients referred to us from Longisa (20-30 min east of us on good roads) for a variety of reasons. A primary one that I see is for a C-section...reasons listed for referral being among the following: no anesthesia, no doctor, theatre being remodeled, no blood, no IV fluid, higher level care needed...etc. We were curious at the functionality of the hospital. It was a very enjoyable trip. Ronald met us at the door--he is not only a former intern but is now starting in Tenwek's family medicine program, so Eric has spent a good bit of time with him. The head matron and a supervisor also came with us for the tour, which was an honor. Longisa is pretty new (built within the last 15 years) and looks very nice--wide corridors, clean, no overcrowding, new lab equipment. It has been well kept up. Obviously not every service must be available, since patients are frequently referred to Tenwek, but when it is available it is much more affordable for the patients since care is subsidized by the government. Our favorite part of the tour was actually the price lists painted on the walls! It was interesting to see what was charged for what procedure. Many things are free for patients. 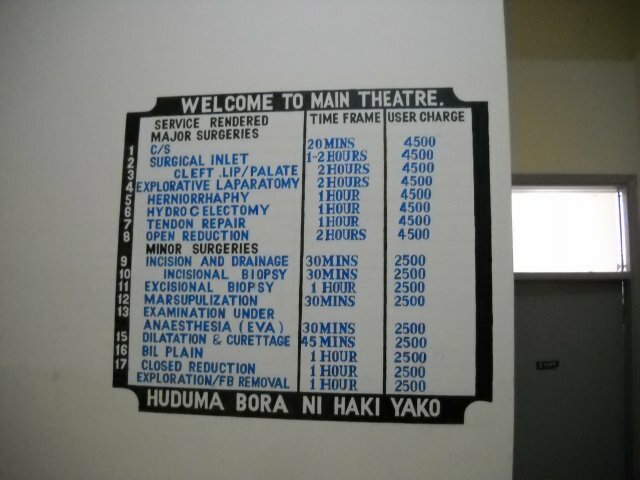 As a point of reference, Longisa charges 4500 shillings for surgeries, and at Tenwek it is probably closer to 20,000 shillings (still a deal compared to US costs at an exchange rate of 90 shillings to the dollar, but pricey none the less for our patients). This gives us another good point of reference to working in Burundi, where the hospital setup will be far different than what we have at Tenwek. Anything we can learn in advance is appreciated.